Have I mentioned that I like ice hockey? I bet I have. During the 2011 Stanley Cup Playoffs I knitted hats while watching the games. Lots of hats. Lots and lots of hats. Thirty-one of them. And although the playoffs ended in June with The Cup going to the Boston Bruins, my hat-knitting hasn’t stopped. I’m currently trying to catch up my blogging to my hat knitting, something that is easier said than done. Today’s featured hat is a little number I call Penguins Galore. It is a hat of my own design, but it isn’t entirely original. 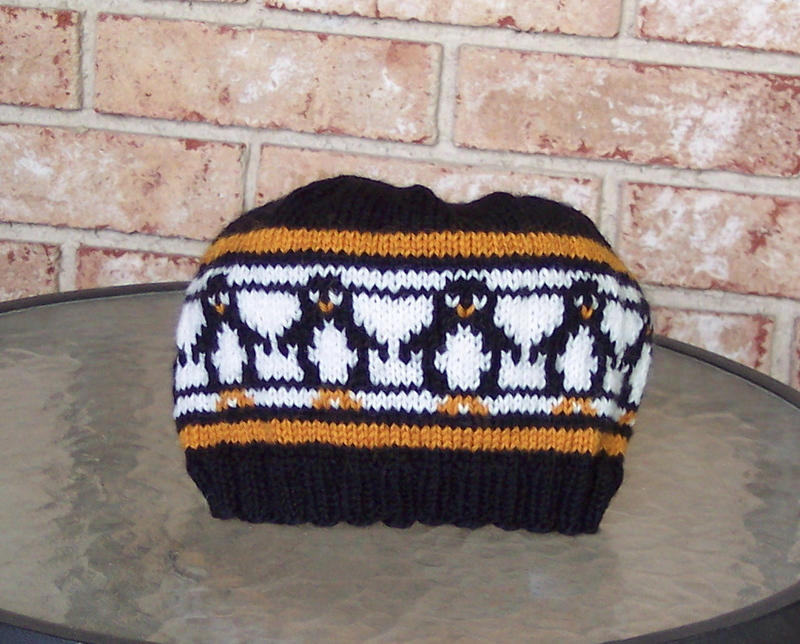 I saw a knitted penguin that I really liked here, so I “borrowed” the chart and adapted it to my hat design. The hat is knitted in black, gold, and white, in honor of my favorite NHL team, the Pittsburgh Penguins. I used Brown Sheep Nature Spun worsted weight in Pepper, Sunburst Gold, and Natural and 3.5mm Aero circular needles. 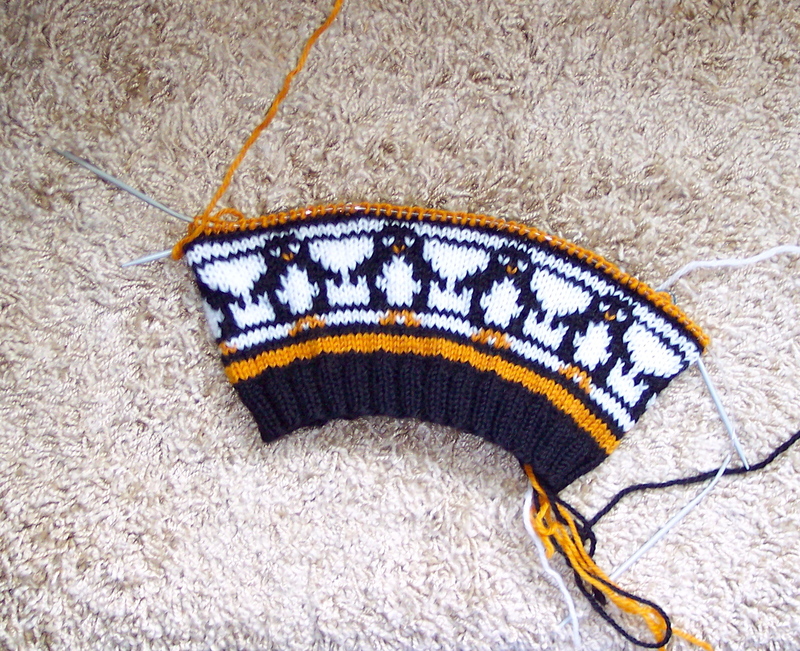 The penguin pattern is a 12-stitch repeat, so I started with 120 stitches at a gauge of 6 stitches per inch. The hat exceeded my expectations and turned out really cute. The little penguins have very expressive faces and look like they are having lots of fun standing around on the hat. And well they should because the hat has found a forever home with the boy’s GF. Yes, life is good, especially if you are a hand-knitted hat covered in penguins. The pattern in PDF form can be downloaded for free from the Pattern section of this web site. Or just click here. I love the penguin hat. My husband was convinced he used to be one in a previous life when he was a child because everyone told him he walked like one. Silly huh? Very cute hat! Good job. I can see many combinations with other animals, but I love those penguins. Thanks for writing it up. Now, if it would only get cold enough here to actually “want” a hat. well, two years later you have another fan! I am in love with those penguins! Thanks so much for the pattern!